It's the Friday before the Friday before the celebration of Christmas, a quaint custom that I delight in, despite my thoroughgoing atheism and my virulently anti-religious sentiments. Still, I love the smell of the evergreen tree and the look of the lights and shiny objects, the miniature villages and dioramas, and most of all the special holiday drinks. For those of you who celebrate this holiday in winter (sorry, Antipodeans), here's a little number that I learned about while excavating in the snow in southern central British Columbia a million and a half years ago. We had to build a large plastic tent over the house-pit we were digging in, and had an airtight stove inside which we kept going all day long. We'd literally chip out shovel-sized blocks of frozen dirt and warm them in buckets on and around the stove to make them soft enough to screen, and took turns working the screens outside 'cause after a while you got too cold to pick up lithics and bone fragments, even with gloved hands. The motel we were staying in had a little bar at one end and the seven or eight of us filled it up every evening while we thawed out. The first night the bar-keep suggested that she make us all something called a Polar Bear. Winters have never been the same. 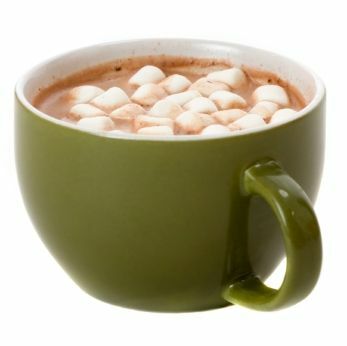 All you have to do is brew up a cup of hot chocolate and toss in a jigger of peppermint schnapps. Mini vanilla marshmallows optional.